A major curse of modern living is the advent of mass suffering from chronic autoimmune diseases. They have become the way we live and the way we die. Now, a study published in PLoS One has documented that vaccinations may be causing this plague. Repeated immunization with antigen causes systemic autoimmunity in mice otherwise not prone to spontaneous autoimmune diseases. Chronic diseases are the inevitable result of vaccinations! The mice used in this experiment were ones bred to have no autoimmune disorders, so the ability to stress them to the point of inevitably suffering from autoimmune disorders is particularly significant. T-cells, commonly called killer cells, are a type of lymphocyte (white blood cell). They are a critical part of the immune system. CD4+ cells are a type of T-cell. They initiate the body’s response to infections. The study found that overstimulation of CD4+ cells results in the induction of autoantibodies, that is, antibodies that attack the self instead of invaders. That is virtually the definition of an autoimmune disease. The authors specifically found tissue injury like that of the disease lupus erythematosus and other autoimmune disorders. The researchers used Staphylococcus entertoxin B (SEB) to inject mice bred for their lack of autoimmunity. Injection initially resulted in loss of energy in a particular kind of CD4+ cell, Vβ8+. These cells recovered through 7 cycles of injections. However, the Vβ8+ cells were unable to recover after the 8th injection. At that point, they started to produce the autoantibodies. As the term rheumatoid factor seems to imply, these are significant in rheumatoid arthritis, an autoimmune disorder. The last item, anti-galactose deficiency IgG antibodies, is used as a marker to diagnose the disease. The researchers also showed that ovalbumin (OVA) and keyhole limpet hemocyanin, also induce autoimmunity after the 8th injection. The authors included graphic images of autoimmune tissue damage from the experiments. Immune complexes (ICs) of proteinuria are indications of autoantibodies. 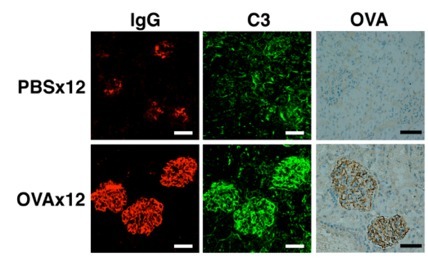 The image above shows the development of ICs of Immunoglobulin G (IgG), C3 (indicative of lupus erythematosus), and OVA in mice injected 12 times. As in the previous image, PBS refers to the results of the injection of a nonantigen, and the results on the bottom are injection of the known antigen, OVA. The image is of a microscopic magnification of 400X. 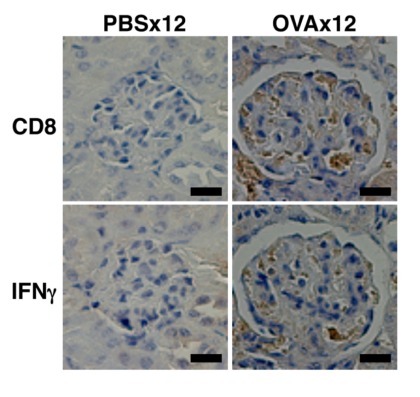 The next image above shows infiltration of CD8 cells in the kidneys and anti-interferon (IFN) autoantibodies in mice injected 12 times. The image is of a microscopic magnification of 300X. As in the prior images, PBS refers to injection of a nonantigen and OVA is the injected antigen. Diffuse membranous (wire-loop) glomerulonephritis in the kidney. Proliferative glomerulonephritis in the kidney. Infiltration of plasma cells around hepatic bile ducts. Enlarged lymphoid follicles with marked germinal center in the spleen. Occasional lymphocyte infiltration into the salivary glands. 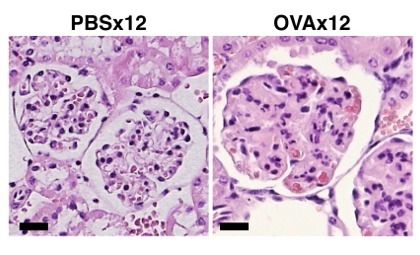 Perivascular infiltration of neutrophils and macrophages into the skin dermis of the auricle. The authors also reported that injection of the damaged CD4+ cells into the autoimmune disease-safe mice transferred the damage to them. The implications of that are huge. It means that no one suffering from an autoimmune disorder should be allowed to donate blood, because they could also be donating their diseases. Then comes the rest of the alphabet, including lupus erythematosus, rheumatoid arthritis, multiple sclerosis, chronic fatigue syndrome, Guillain-Barré syndrome, and frankly, too many others to list here. With this information in hand, can there be any justification for the current extreme vaccination schedule that exists in virtually all nations today? Can there be any wonder that the industrialized nations giving the greatest number of vaccinations are those with the greatest infant mortality rates? The information exposed by this study clarifies that there can be no justification for the push to vaccinate. There is also no justification for the lack of research into the effects of the full schedule of vaccines. With this information, the routine injection of vaccines into children or adults is clearly unjustified. Stress is a problem for many, likely most people in modern society. We’re constantly told that it’s a killer. Does that mean we should have a vaccine to stop it? That’s the goal of one scientist, and when the implications of such a vaccine are considered, it’s hard to believe that any tyrannical government would be able to resist it. Just imagine—a society of happy slaves. It’s every dictator’s dream come true! It’s not just science fiction. It’s a coming reality. Robert Sapolsky is a neuroscientist at Stanford University in California. He started his career in the study of baboons, whose lives are controlled by a hideously restrictive hierarchy. While in Africa, he noted that the baboons at the bottom of the social order suffered great stress and lived shorter, less healthy lives. Eventually, his research arena in Africa became polluted with too many people and all that entailed, including garbage dumps and pollution, which literally polluted his research. So, he took it up at Stanford, where he redirected his efforts into finding a way to ease stress in the belief that he’d be improving people’s health. So, rather than trying to find ways to alleviate stress, he and his team of researchers set out to find a way to stop the physical effects of stress. Glucosteroids are the hormones that create the stress response, so he focused on finding ways to circumvent them. Sapolsky and his team used genetic engineering to create a herpes virus that carries “neuroprotective” genes, but has the genes that are harmful to humans engineered out. These so-called “neuroprotective” genes are designed to produce growth factors, antioxidants, and estrogen mimickers. In other words, they’re planning to remake a major portion of the endocrine system and produce artificial antioxidants that have not been mediated through the digestive system, and add growth factors that can stimulate cellular growth and proliferation, which sounds suspiciously like cancer. Anything that forcibly modifies the endocrine system is playing with fire. Our hormones are in a constant state of balance. When one is changed, it has a cascading effect on other hormones and body functions. There’s a reason for increased glucocortisoids in stress. Yes, it’s true that their function is to help the body respond to immediate danger, and these hormones are out of place in modern society. But what’s really wrong? Our bodies or society? As Sapolsky has noted, the stress that people feel comes primarily from society’s inequalities and insecurities. The things that have brought us peace in prehistorical times—having a degree of surety that we won’t starve, that if we don’t eat today then we’ll eat tomorrow; having the support of our society when we’re in need; having adequate leisure time—are no longer routine for most of us. Worse, we’ve created a society of severe inequality, which leads to insecurity for nearly everyone—and it’s getting worse. If we lose our jobs, will be lose our homes? Will be be able to feed our families? If we get sick, how will we pay for care? Will anyone care for us when we get old? Who’s watching the kids? Children past the toddler years spend more time with their parents than ever before, resulting in more stress for both. We don’t get enough sleep. We don’t get enough time off. And for most people, work isn’t satisfying. The fact is that most of us are stressed most of the time. Some manage it better than others, but it’s a factor in our lives. But why would we want to change our basic nature—to force ourselves into a kind of placidity in the face of all these pressures—instead of finding a way to change our society to make it better serve us? “In humans this engineered virus would short-circuit the neural feedback caused by stress, that lingering feeling of tension after a crisis has passed. It would leave you fresher and ready to deal with another threat, so you can maintain your drive, but with more focused calm rather than bad temper and digestion. No doubt it could change society—by creating a mass of people who aren’t really bothered by anything, people who are calm and content in the face of unacceptable treatment. People who would make excellent slaves in a society that exists primarily to support the wealth of a very few. Then, there is the question of how the body would react to forced changes in how it deals with stress. We feel stress because it’s of value to us. It tells us that we need to do something to change our current circumstances. What better clue do we need to tell us that our society has gone mad? Is Sapolsky’s colleague right that the vaccine would result in people feeling “fresher and ready to deal with another threat” or is it wishful thinking? It strikes me that he’s mixing his concepts. He’s referring to threats in the same manner that hunter-gatherers would, as things that come along and then pass. But he’s applying that concept in a world of constant stress. The problem isn’t merely lingering tension from individual incidents, it’s that the primary causes of stress are ongoing. Even if the stress vaccine works as he’s described, it would have completely unanticipated results. The problem isn’t that our stress comes and goes; it’s that it builds and builds. It can’t go away because most of the inciting causes are constant. Notice that the injected virus carries the ability to create artificial estrogens. We know that messing with the estrogen balance in the body is an exceptionally risky thing to do. It’s associated with breast cancer. Giving artificial estrogen to women in hormone replacement therapy (HRT) resulted in exactly the opposite of what was intended: HRT increases the very conditions it supposedly prevented, including cancer and heart disease. The injected virus contains growth factors. Just what would be induced to greater growth? More cancer? Faster growing cancer? Faster cell death? We don’t really know. We simply don’t know the full range of effects that a stress vaccine would induce. It would probably take years for all them to become apparent. And when they do, will we have become a society of zombies who’ve lost the ability to respond to new dangers after our hormones have been so modified that we’re beyond any hope of achieving health? Vaccines carry inherent risks. All of them include adjuvants, substances that create a stronger autoimmune response. These work by causing irritations that make the immune system respond more strongly to the injected vaccine material. They can also cause autoimmune disorders, both directly from toxicity and indirectly through antibodies to substances that are normally found in the body. Many autoimmune diseases are associated with vaccines, including rheumatoid arthritis, and at least one new disease, macrofagic myofasciitis, is known to be directly caused by vaccines. The very idea that injected squalene, which is an oil produced by the liver, is safe is ludicrous on the surface. The act of injection turns it into an invader, to which an active immune system may respond by creating antibodies against it, thus creating an autoimmune disorder. Aluminum and formaldehyde, common vaccine ingredients, are also highly toxic. And these are only some of the additives that pose serious danger. Although the naysayers continue to state that autism isn’t caused by vaccines, the fact is that the studies purportedly proving it have been fatally flawed, and much good research does demonstrate a strong link. There is also the fact that, as new vaccines are added to the schedule, the rate of autism and associated neurological and gastrointestinal disorders rises. Any suggestion that people should add yet another vaccine to an already intolerably large schedule takes us beyond madness. Last, but certainly not least, is the potential of an anti-stress vaccine zombifying the populace. Stress is not, by definition, bad. Stress is nature’s way of telling us that we need to make changes. The potential of an anti-stress vaccine to create a populace that can’t be aroused because the stress function has been destroyed is a terrifying specter. If everybody is always stress-free, they’d always be mellow. They wouldn’t be particularly troubled by problems in their lives, so they wouldn’t be easily motivated to do anything about them. What tyrannical government wouldn’t want to make its citizens so malleable? What corporation wouldn’t want such complacent people to consume their products? At its base, an anti-stress vaccine is an anti-human vaccine. It has the potential to turn the masses of people into virtual automatons, natural slaves to support an insatiable corporate appetite, lacking the ability to rebel against tyranny. To play with a Scottish phrase, the best intentions gang oft awry. 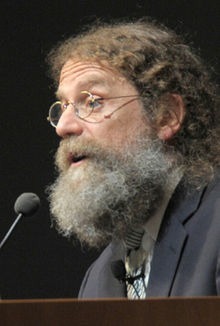 As his photo shows, Sapolsky is an iconoclast. It’s too bad that his inclinations in that direction don’t extend to seeing either the full implications of his idea or to a recognition that one cannot force health onto people. The more we’ve use drugs and the more vaccines we’ve gotten, the worse our health has become. Chronic diseases are now the norm, rather than the rare exception. Rather than trying to find ways to resolve the causes of chronic stress, he’s focused on a technical approach. At some point, the insanity needs to stop. If stress is a health problem, then it’s because we live in a society that creates abnormal stress. The only real fix is to resolve the cause, not the symptoms. The question of what would become of people who’ve lost the ability to respond to stress is never addressed—and that may be the most disturbing question of all with regard to an anti-stress vaccine. Could such a vaccine lead to a society filled with people who’ve lost the spark that makes them strive to form a better world? Do we want to take the risk of finding out? Sadly, Sapolsky seems to have swallowed the poison of science as a fix for everything. He appears to be well-intentioned and genuinely desirous of helping people. But that doesn’t make him right about an anti-stress vaccine. On January 3-7, 2011, a vaccine safety conference was held in Montego Bay, Jamaica that included a diverse groups of delegates from around the world, including senior scientists and physicians, editors of scientific journals, experts in vaccine regulation, social science and health policy, consumer child health advocates, legal experts and members of the media.